Do I need a logo? Not necessarily. Do I need a logo? That's a question we get a lot. The Kind Aesthetic logo. We decided to go with a logo because we are a business and needed a way to represent ourselves across media–including as an icon on our social media feeds. Let's start by defining what a logo is. A logo is a graphic and/or typographic mark that identifies a business or organization. It is only one element, although an important one, of an overall brand identity. So there's that word. Brand. Most artists we know shy away from that word because of its corporate connotations. Totally understandable. But what exactly is a brand? A brand is all of the experiences, knowledge and impressions a person has about your product, service, or organization. It's the emotional and functional benefits (the gut reaction) people associate with your product or services vs. the actual attributes. So as an artist or creative entrepreneur, we are willing to bet that you want people to have a positive gut reaction to what you do. That right there is the essence of your brand. As we mentioned in the first paragraph, a logo is a small part of a "brand identity." What does that mean? A brand identity is all the visual aspects that form part of the overall brand. So if you are an artist who makes visual work, part of that identity is already established by your work. However, you might realize that you need to find a way to tie all of your other materials (website, CV, image lists, press releases, etc.) together. That means that you need to come up with a set of visual devices that you use every time you need to send out materials: choosing fonts, color palettes, layouts and so forth, that you repeatedly use so that there is a visual cohesiveness to all of your materials. So do you need a logo? Artist and designer Annie Coggan uses her name across her materials and keeps it consistent and memorable by using a distinctive font and color. Not necessarily. If you are an artist who is just promoting your own work under your own name, you do not need a logo. What you need is to find a typeface you like and always use across all of your materials. It is very likely that you are frequently sending out PDFs or printing out your CV or image list for exhibitions. You need to establish a visual identity for those materials (i.e., have a letterhead that always looks the same with your name, contact info and website). Bonus points if it's nicely designed. Use that same typeface on your website, and you are on your way to creating a cohesive visual identity. Bergwerk is a small clothing design company. The logo contains several connotations, including the letters B and W, a reference to mountains (Berg in German and the owner's last name), and the sewn zigzag stitch. So what if you are a creative entrepreneur or small business owner who has a separate business name? In that case, you might want to consider a logo, so that you can use it on product packaging as well as all of your marketing materials. Logos are a tangible way to express some of the essence and characteristics of your brand, and a good logo can help differentiate you from your competition. The main role of a logo is for identification. A logo derives its meaning from the quality of the thing it symbolizes, which means we circle back to the idea of the brand–that positive emotional gut reaction you want your audience to have. A logo is only as good as the brand it represents. Let us know if you have any questions or whether you have made the decision to have a logo--or not! I don't make objects, but offer services. How do I visually represent these on my website? As discussed in our previous post, as an artist/creative entrepreneur, you are in charge of how you present yourself and your work to your ideal audience, therefore your design choices and image choices matter. A lot! Today we are going to concentrate on how to show what you do when you don't have actual objects to sell. We often get this question from coaches, writers, consultants, and other creatives who don't make physical objects. So, what do you do when you offer a service and want to attract the right clients? 1) It's important to articulate what you do and what kind of service you provide. What is your process? Write it all out. This exercise should start with a) describing your client's problems, b) how you solve them, and c) clearly delineating what kind of results they get from you. 2) Next, think about the emotional response you want to convey through your business (strength, confidence, soothing calm, etc.) Start to collect images and color swatches that appeal to you and have a feeling that is similar to the one you want to convey. Break down the types of colors that appear in these inspiration images. Each color has psychological connotations, so make sure that the colors that appeal to you match the feeling you want to convey through your business and visual materials. This post takes you on a journey of how to create a mood board that will help you find the right color palette that can represent your business. You might actually have to show what you do, such as a video describing your work, or photographs of you at work, so people can get a sense of who you are. But sometimes, the previous option won't work so you have to turn to aspirational imagery from stock photography or hire a photographer to create unique images that work for you. Next, Carolyn Cirillo is a marketing writer for the interiors industry. She needed to speak to clients in the design world while not being a designer herself. The best option for her was the use of stock photography that elicited the feeling she wanted to convey about her work to her ideal audience: clarity, intelligence, organization, and a sense of sophisticated design. We love the images on her website because they are pleasant to look at, inspire confidence and are unifying in color and theme without being boring or redundant. Plus, the color choices with her logo and navigation were intentional, and pop nicely, since they are complementary colors. Choosing the right images to support your service-based business can be a challenge but our advice is to always go with your gut and be sure to examine what you love (and hate) because it will ultimately create the best end product! You are unique in what you do, and your tastes, background and process all support that! Let us know if you need a hand and check out our services here. Stand out by defining your visual style. This post is updated and adapted from one originally posted on February 24, 2015. As artists and creatives, we all occupy so many different roles in our lives that sometimes we need a boost in seeing the big picture. We need to assure that we stand out in this vibrant, saturated, creative world. So, how do you let your audience know who you are, tell your story in a compelling way, and genuinely show that your art work or creative product and services are so incredibly unique? Sharing your story with words and visuals that support your work are the best way to stand out, but how? Collect images with colors that appeal to you to help you create a new color palette. We guarantee that the more specific you get, the more exciting your story will become. These words serve as the framework for writing your statement and pitch, but can also be used to shape the visual support for your story. For example, if you describe your work as geometric, vibrant and strong, those words provide a guide for the kind of colors, typefaces and layouts you might want to consider for your website. 2. Research your competition. Have fun making a giant spreadsheet of who else does work similar to yours. And remember, you and they are inherently unique. So the question to ask yourself when you are looking around is: "How am I different?" 3. Collect visuals. Words are your tool to telling your story in person and on your website, but don't forget about the visuals! What kind of materials, processes, and inspiration do you use to do what you do? Document all of these in a beautiful way–for example, if you are a printmaker, create a video that shows your process! Another helpful way to start developing a visual story is by creating mood boards that reflect how you want to represent your work, the kinds of color palettes you like, the typefaces you are drawn to, and anything else that inspires you visually. You can organize your boards into categories and start developing your personal visual style that will help support your story and your work and make you stand out from the crowd! I'm an artist, but do I need to be a designer, too? Personal branding demystified. You're an artist or a creative entrepreneur, so your work is visual and/or emotional, right? People look at it or experience it and respond to it in positive ways. All of the "stuff" that supports it should give people that good feeling, too. For instance, have you ever hired a professional to do something and you received a document from them as a .doc and the font was Comic Sans?! (If you don't know what that means keep reading, and if you're laughing, albeit snootily, keep reading, too. There is something in this post for everyone.) For visual and emotional reasons, this design faux pas made you less confident in them because they have not invested the time and energy to present their business professionally. It's an emotional thing; it doesn't mean that they have done a bad job for what you've hired them for. But it can make a lasting negative impression. Your art work or creative product lives in the world of art, design and creativity, so all of your marketing materials and online presence should look the part. Cohesive and contemporary design and visuals are imperative to gain trust in your ideal audience or client. Ok, we know you already do a lot. Because you are an artist or run your creative business does not mean you need to download the entire Adobe Creative Suite and teach yourself new skills. There are short cuts and people to hire to help you. But your job is to be conscious of how your marketing materials support your work. 1) Images of your work. Your work should be documented in a clear, beautiful way. 2) Font choices. Typographers develop options for typefaces because they have an emotional and visual impact on how we process information. 3) Logos. Do you need one? We'll be exploring that later this month. 4) Color. A very important aspect to your personal brand and also an emotional one. The psychology of color is a field unto itself, and our culture ties strong meaning to certain colors. Most important, though, is whether the colors you choose to use support and match the work or information you are trying to convey. All of these design details (as well as some additional nittier grittier ones) will be covered throughout May on our blog and on social media, so be sure to follow. What design questions do you have? Share them below and we'll answer! If you’re a writer, performer, actor, musician or make other non-visual work, you know you need an attractive website. How can you make it look amazing and draw your ideal audience in with smart, compelling content? Tell your unique story. Let your audience know who you are and the kind of work you do. Share a photo of yourself. Be your brand. Have a beautifully designed site. If you are not a visual person, hire someone who is. Don’t lose your ideal audience with bad design. Documentation is key. Look back at all of your work and create a curated archive that you can share on your site. Use photographs, press and description to provide a visually engaging summary of your projects. No photos? Use case studies. If your work really doesn’t have any images to go along with it, don’t be afraid to create some amazing case studies. We have a great post about how to create a case study here. Having a well-designed, wonderful website offers you credibility, give your ideal audience confidence in what you do, and provides a personal archive for yourself that can work for you online. Good luck! Let us know if you need help. How to make an amazing case study about your work. 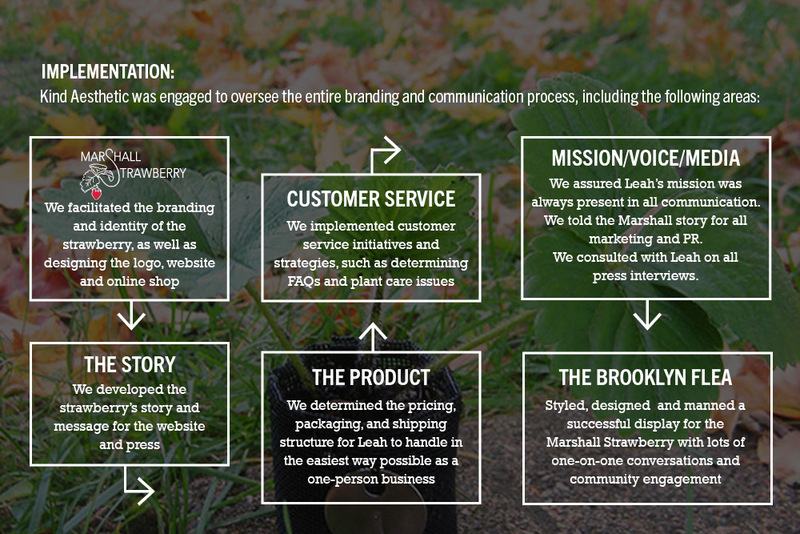 The best case studies tell us a story about the amazing work that you did to help your client. It's a satisfying task to look back at your previous work and retrace your steps from start to finish. Let's look at an example. 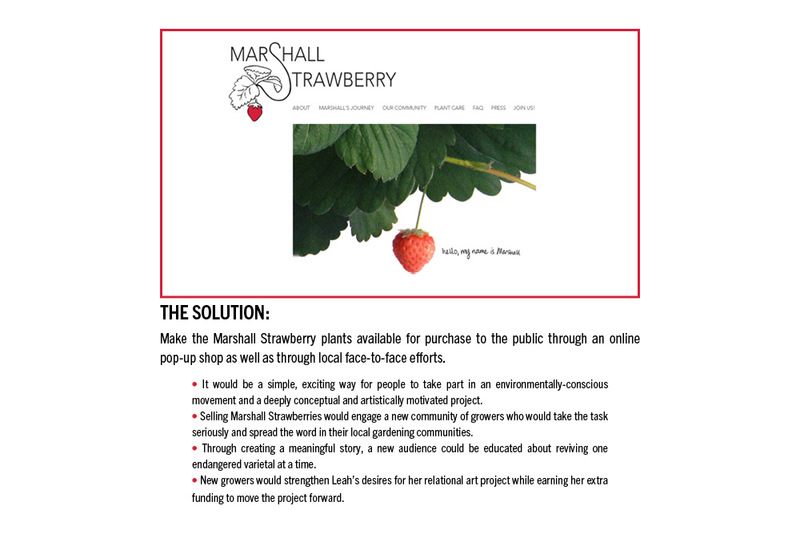 The Marshall Strawberry project was a unique endeavor in collaboration with artist Leah Gauthier. Scroll through the slides below. 1) What problem did we solve? What did the client need? 2) How did we do it? What was our unique approach? 3) What were the amazing results? From there, we could tell the story from an outside perspective, making it easy for anyone to understand the work we do. And it's also important that the case studies are well-designed, because everything should be! Taking the time to create powerful summaries of your work help create a long lasting archive of your work that solidifies your brand and tells the story of what you do while you are not there to explain it. Take a look at our other Kind Aesthetic case studies here. Good luck with yours and let us know if you need help telling your brand story! Do any of these statements describe you? I need help visually defining my brand. I need photographs of my work and I don't know where to start. I am struggling with how to showcase my work online. I want to start a blog but I have no idea what I want it to look like. If so, then this post is for you! No matter what you do or make, it's imperative that your work looks amazing and unique, but sometimes it's hard to get started. One of our fortes is pinpointing exactly what makes each of our clients unique and how to share that compelling story with words and images. The journey to defining the mood of your brand often starts by not looking inward, but rather by collecting images from your world that stand out to you or inspire you. What is your taste? What colors are you drawn to? You see everything in your unique way and no one can replicate your taste and vision. Starting a Pinterest board is a great way to figure out your visual style. Artist and designer Annie Coggan uses Pinterest in a really effective way—check out her boards to get a sense of her visual style. 1. Start some private Pinterest boards. This is a great way to create a visual archive where you can store images that strike you as you come across them. Perhaps you are looking to start photographing your products; start a board that collects beautiful images that can inspire your future product shots. Or maybe you need a new logo but words aren't enough to share with your designer; start a board that collects colors, fonts, imagery and more that you feel truly represent notions of your brand. Go on some Pinning sprees and then analyze your boards to get on the track to creating your own beautiful visuals. 2. Take your own photographs. We all have high quality cameras with us all the time: our phones. Whether you choose to post photos on Instagram or keep to yourself, photographing the moments in your life that exemplify your work and your brand is an amazing place to start defining who you are visually. If given the same subject, an entire group of people will take a different image when given the chance to stop and look. Give yourself an assignment to take a photograph a day that represents your brand and your work. This will be fodder for future visuals and even future blog posts! Instagram is another great way to start keeping track of your personal visual style. Here is a screenshot of Heartell Press' visually cohesive Instagram page. With all of this, have fun! You're at a really exciting point in your journey to telling your unique story to the world about what you do. If we can be of any help along the way, let us know! This is our passion. *We've recently been writing posts for the Freelancer's Union blog: a wonderful resource for creative tips and inspiration, as well as an amazing community. Here is our latest post. FACT: You are the only freelancer in the world who does exactly what you do in your unique way. Make sure that you are showing your work in the best possible way to your audience. This post is for you if you want to show what you do and how you do it to your ideal clients in your marketing materials and on your website (So, um, everybody). Even if you don’t do visual work (we’re looking at you writers and consultants) or even if you are a prolific designer or decorative painter, we have some great advice below that will get you feeling confident, organized and telling the right visual story to those that count. invest in the best way to document your work, which can mean hiring a designer or photographer that you work well with and who understands how you want your work presented. Oh, and the golden rule: back your stuff up on the cloud and on a reliable external hard drive... always. This is the basis for success! Click here to read the 5 steps!